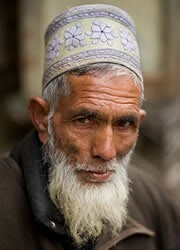 Overview: The Kashmiri people are a sub-group of Indo-Aryan peoples originating from the former Indian state of Kashmir. That former state is presently disputed territory, with portions controlled by the governments of India, Pakistan, and the People's Republic of China. The vast majority of Kashmiri peoples reside in India's state of Jammu and Kashmir. Since the 14th century, Sunni Islam has dominated the Kashmir region, though isolated pockets of Hindus and Buddhists may still be found.